Function Central has handpicked the most exciting and professional Cambridgeshire wedding bands, putting a fantastic choice of music at your fingertips! Our bands have experience entertaining at venues and parties throughout the county, including Cambridge, Peterborough, Wisbech, St Neots, Huntingdon, March, Ely, St Ives, Whittlesey, Chatteris, Yaxley, Soham and Cambourn, as well as Norwich, Ipswich, Bedford and Braintree. Our Cambridgeshire bands for hire range from small 3-piece line-ups predominantly featuring guitars, through to ten-pieces with extra backing vocalists, percussion, horn section and even dancers. Most of them perform catchy and melodic rock and pop music from the last seventy years, meaning grandparents and grandkids alike can enjoy the music. If mainstream Western music isn't your thing, we can provide bands from around the world, from steel pan to Afro-Cuban. Alternatively, hire a Cambridge ceilidh band for a knees-up in a barn or a Cambridgeshire swing jazz band for a more formal affair. Whether you’re planning a shindig on a shoestring or a carnival extravaganza, we’ll help you find the perfect act for your day. Need Cambridge wedding musicians for your ceremony, drinks reception or meal? Fear not, we do that too! If space is limited, hire a harpist for the reception or a soprano to sing you down the aisle. A jazz trio will keep the mood light at dinner and help break the ice, whilst a wedding singer is great for distracting guests whilst you have your photos taken. For a wider choice of acts, also see our wedding bands in Essex, Suffolk, Northamptonshire or Norfolk. Please add your event date and location to check availability. Top-flight party band delivering exceptional value for money, with male and female lead vocals and the best pop, rock and soul hits. Extra musicians available, including brass section, rapper and strings, as well as acoustic sets and DJ service. 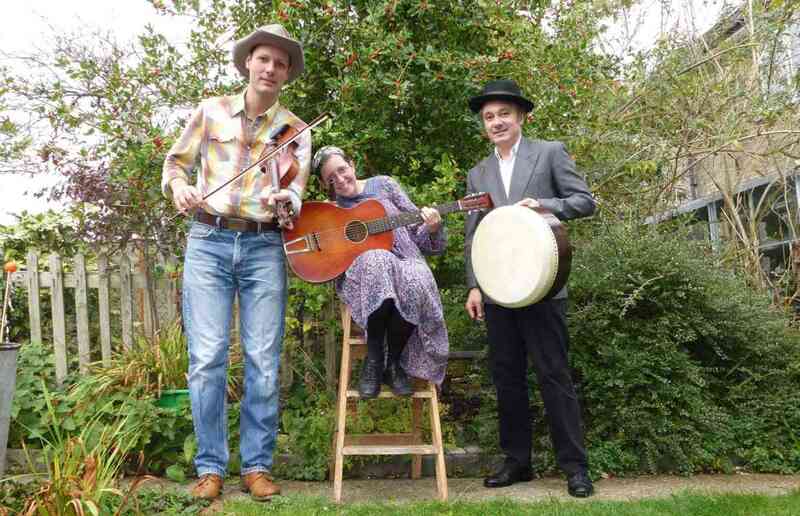 Energetic ceilidh, folk and barn dance band, playing Irish, English & Scottish classics through to old-time American and classical piano; they throw it all together, and everyone has a good time! Optional caller. Amp up your party with Rockit: a sensational party band with a huge catalogue of rock, indie and pop floor-fillers from Chuck Berry and The Beatles to The Killers and Ed Sheeran! Larger line-ups, acoustic background sets and DJ service available. Midweek discounts available. Super-talented function band with both male and female vocals playing a range of catchy rock/pop anthems as well as the very latest chart music. DJ and acoustic sets available. Charismatic new party band, taking the London party circuit by storm. The Wandering Lights perform upbeat, folksy acoustic covers by Avicci, Blackstreet and R Kelly. Also available as an unplugged roaming band (free to wander around your venue). Outrageously talented and dapper new party and wedding band, combining session standard playing with a classic R&B-tinged repertoire of funk, soul, hip-hop and pop ideal for dancing. DJ service and acoustic set available. The finest party and wedding band performing rock, indie, R&B and chart music with charisma and energy! Hire the band’s DJ service for a seamless night of music. Experienced East Midlands wedding and party band with a massive playlist of rock, pop, reggae and soul, from Bob Marley to Bruno Mars. Afternoon acoustic sets and DJ service also available. Versatile and energetic male and female-fronted band with a large song list taking in soul, pop and rock music from Elvis and The Beatles to Daft Punk and DNCE. Available to hire with extra musicians, afternoon/dinner jazz sets and/or DJ service. Fun, lively 4-piece playing classic and modern rock & pop with a jazzy, boho twist! The band's winning combination of infectious energy and dancefloor cool is winning over audiences at weddings and parties up and down the UK. High-energy wedding and corporate function band in the South East, playing crowd-rousing pop, rock, dance, funk and soul music from the 1960s to the present day. The band have played Glastonbury and the Roundhouse and count Audi and Nintendo amongst their regular clients. DJ service and acoustic sets available. On-trend wedding function band, suitable for all events from classy wedding receptions to high-end corporate events. The band cover rock and pop music from Elvis and the Beatles through to The Killers and Sam Smith. DJ service, brass section and acoustic sets available. Laidback acoustic duo with both male and female lead vocals, playing soulful covers from the likes of Al Green and Marvin Gaye through to Emile Sande and Adele. Seasoned wedding and corporate function band formed of in-demand session players. Expect a barrage of rock and pop anthems from Queen Pharrell and dancing all night! Additional musicians, the Trio, DJ and acoustic sets available. A quirky and entertaining acoustic/cajon duo featuring both male and female vocals – ideal as background music or upbeat party songs for dancing. Pro DJ service also available. Experienced male-fronted trio, and purveyors of the finest rock, soul and indie covers! Great value for wedding celebrations and parties. Female vocalist and afternoon acoustic sets available. Slick and super-professional party band with superb female and male vocals that cover everything from current chart hits to classic floor fillers. Book with additional keys and DJ options. Super-talented and authentic rock and pop band, whose sensational live performances at corporate parties, birthdays and weddings have attracted the attention of EMI. The band are unique in that they come with their own dedicated, professional DJ. The hottest new function band in London, featuring some of the best performers in the capital – bound to get your guests dancing at corporate events and high-end weddings! Additional musicians and afternoon acoustic jazz sets also available. Midweek and low season discounts available. With stunning joint male and female lead vocals, exciting soul, Motown and funk band Brother Brown are a musical monster! 4, 5 and 6-piece band available. Turbo-charged party band with a large song list of danceable and melodic rock and pop anthems. Great value and a huge sound! Hire the band’s DJ and acoustic sets for music throughout the day. Low season and midweek discounts available. A zesty, female-led party band playing popular 40s to 00s jazz, rock ‘n’ pop covers with a unique twist - think hot club, ska, country, bossa, rock, reggae & swing all blended together to span the generations! High energy party band with a big sound that’s perfect for weddings, parties and corporate events. They feature superb male vocals and sax, but also offer stripped-back line ups, afternoon acoustic or jazz sets, stage hire and DJ service. Energetic party band playing crowd-rousing anthems by Huey Lewis, The Killers, Oasis, Amy Winehouse, Pharrell and more! Afternoon solo/duo acoustic sets, longer performances, larger line-ups and laptop DJ service available. World-class brass and drums party band who are regulars at Glastonbury and have performed for Jamie Oliver and Liam Gallagher. American_Express_logo Created with Sketch. Created with Sketch. Icon Created with Sketch. Line Created with Sketch. Facebook Created with Sketch. Icon Created with Sketch. Created with Sketch. icon Created with Sketch. Instagram Created with Sketch. Icon Created with Sketch. Logo Created with Sketch. Mastercard Created with Sketch. Pinterest Created with Sketch. Play icon Created with Sketch. Line Created with Sketch. Group 7 Created with Sketch. Imported Layers 2 Created with Sketch. Imported Layers 2 Created with Sketch. Powered by Stripe Created with Sketch. Twitter Created with Sketch. Visa Created with Sketch. YouTube Created with Sketch.